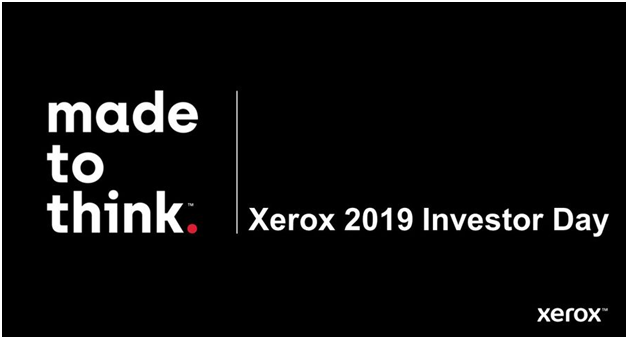 Xerox Outlines Three-Year Strategy at Investor Day; Guides to over $3 Billion of Cumulative Cash Flow and Annual EPS Expansion | Industry Analysts, Inc.
NEW YORK — Today Xerox (NYSE: XRX) is holding an Investor Day to provide the investment community and other stakeholders details on its strategic initiatives and financial plans. Details on how the company plans to re-energize innovation by leveraging its intellectual property in adjacent areas, exploring opportunities where it can gain traction in high-growth markets. The company’s Powered by Xerox® strategy is designed to leverage Xerox technology to drive developments in digital packaging and print; 3D printing; AI workflow assistants; and sensors and services for the Internet of Things. In the era of intelligent work, we’re not just thinking about the future, we’re making it. Xerox Corporation (NYSE: XRX) is a technology leader focused on the intersection of digital and physical. We use automation and next-generation personalization to redefine productivity, drive growth and make the world more secure. Every day, our innovative technologies and intelligent work solutions—Powered by Xerox ®—help people communicate and work better. Discover more at www.xerox.com and follow us on Twitter at @Xerox. Adjusted EPS – reported GAAP EPS adjusted for restructuring and related costs (including our share of Fuji Xerox restructuring), the amortization of intangibles, non-service retirement-related costs, transaction and related costs, net and other discrete or unusual adjustments. Adjusted operating margin – reported GAAP pre-tax margin adjusted for the EPS adjustments noted above as well as the remainder of Other expenses, net, which are primarily non-financing interest expense and certain other non-operating costs and expenses. Free cash flow –cash flow from continuing operations less capital expenditures. Reconciliations of the above measures to GAAP, for the periods noted, cannot be provided without unreasonable effort due to the uncertainty of the reconciliation amounts such as restructuring, non-service retirement costs, intangible amortization, other expenses, net and the related income taxes effects on those items. This release, and other written or oral statements made from time to time by management contain “forward-looking statements” as defined in the Private Securities Litigation Reform Act of 1995. The words “anticipate”, “believe”, “estimate”, “expect”, “intend”, “will”, “should” and similar expressions, as they relate to us, are intended to identify forward-looking statements. These statements reflect management’s current beliefs, assumptions and expectations and are subject to a number of factors that may cause actual results to differ materially. Such factors include but are not limited to: our ability to address our business challenges in order to reverse revenue declines, reduce costs and increase productivity so that we can invest in and grow our business; changes in economic and political conditions, trade protection measures, licensing requirements and tax laws in the United States and in the foreign countries in which we do business; changes in foreign currency exchange rates; our ability to successfully develop new products, technologies and service offerings and to protect our intellectual property rights; the risk that multi-year contracts with governmental entities could be terminated prior to the end of the contract term and that civil or criminal penalties and administrative sanctions could be imposed on us if we fail to comply with the terms of such contracts and applicable law; the risk that partners, subcontractors and software vendors will not perform in a timely, quality manner; actions of competitors and our ability to promptly and effectively react to changing technologies and customer expectations; our ability to obtain adequate pricing for our products and services and to maintain and improve cost efficiency of operations, including savings from restructuring actions; the risk that individually identifiable information of customers, clients and employees could be inadvertently disclosed or disclosed as a result of a breach of our security systems; reliance on third parties, including subcontractors, for manufacturing of products and provision of services; our ability to manage changes in the printing environment and expand equipment placements; interest rates, cost of borrowing and access to credit markets; funding requirements associated with our employee pension and retiree health benefit plans; the risk that our operations and products may not comply with applicable worldwide regulatory requirements, particularly environmental regulations and directives and anti-corruption laws; the outcome of litigation and regulatory proceedings to which we may be a party; any potential termination or restructuring of our relationship with FUJIFILM Holdings Corporation (“Fujifilm”); and other factors that are set forth in the “Risk Factors” section, the “Legal Proceedings” section, the “Management’s Discussion and Analysis of Financial Condition and Results of Operations” section and other sections of our 2017 Annual Report on Form 10-K, as well as our Quarterly Reports on Form 10-Q and Current Reports on Form 8-K filed with the SEC. Xerox assumes no obligation to update any forward looking statements as a result of new information or future events or developments, except as required by law. This entry was posted in Xerox and tagged three-year strategy, xerox by IA Staff. Bookmark the permalink.